928 LH Repair, fault-code 21 "Airmass flow sensor fault"
My car has bad idle running and revision of LH system is also done in the past. Disconnecting the Mass Air Flow does not result in any improvements. When you read out the fault codes of the LH unit, it returns with fault-code 21: "Airmass flow sensor fault". The problem is a broken IC inside the LH unit. This IC translates the MAF voltage into a frequency signal. Most of the time the input voltage of the MAF sensor results in a broken IC. Bad IC in LH unit. 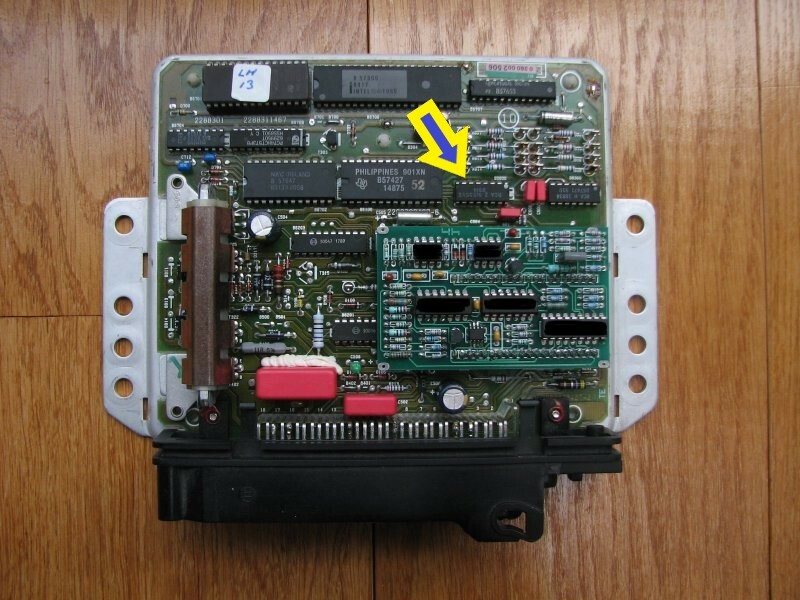 Once you disconnect the faulty LH from your car, send the LH-unit to 928-ecu-repair. We have these (very hard to find) IC's on stock. We offer a 2 year warranty on replaced parts and labor. Any obvious abuse of the unit will render the warranty invalid. Modifications to the car's systems are beyond our control, and are at owners' risk. Please email us for a quotation for your LH repair. Our preferred payment method is bank transfer (or Paypal for our international clients). © 2019 928-ecu-repair. All rights reserved.